Chey Dunkley has made an unlikely late surge up Wigan Athletic’s goal-scoring charts – but the clean sheets are giving him the most satisfaction. The defender has scored three times in the last five games to become their fourth top-scorer. It is the improvement at the back, though, which he is happier about. 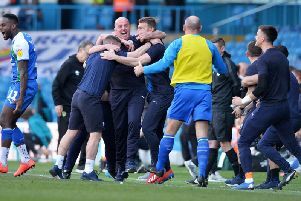 Having leaked more goals than they had liked in several games after Christmas, they have steadied the ship and their 2-0 win at Bury was their third successive clean sheet in League One. And he said: “I’m happy to chip in and score, but my goal is to try and keep them out and I was happy to get another clean sheet (at Bury last Saturday). Latics’ home game with Oldham on Friday begins a frantic period which sees nine games crammed into less than a month. Indeed, only before their final-day trip to Doncaster do they get a full week between matches. Dunkley has figured in 33 of their 36 League One games so far – only Dan Burn, Nathan Byrne and Michael Jacobs, all on 35, have played in more – and he is looking forward to the home-run. “It’s a big ask, definitely,” he added.